With their team up eight points and Ray Allen at the free-throw line, Boston Celtics fans filled TD Garden with a serenade: "Beat the Heat." "Let's do it," Kevin Garnett told ABC's Doris Burke after the Celtics advanced to the Eastern Conference finals. The Celtics beat the Miami Heat three times in four regular-season meetings. They eliminated Heat star LeBron James from the postseason twice while he was with the Cleveland Cavaliers. They are stocked with veterans, and the core from the 2008 NBA and 2010 Eastern Conference championships remains. But they're coming off the series that offense forgot. "Now let us never speak of this series again," NBA blogger Eric Freeman tweeted. The No. 8 seed 76ers dragged the Celtics down the court for seven games, a young team forcing an old team to scrap for every point. Philadelphia and Boston had two of the three most efficient defenses in the NBA last year, so it wasn't a surprise. The Celtics now run into a Heat team that reeled off three consecutive easy victories to knock off the Indiana Pacers, scoring 100 points in each. Miami eliminated Boston in five games last season. Can the Celtics keep pace? That may be the biggest issue. In the first regular-season meeting, the Heat pushed the tempo to take advantage of the Celtics' aging stars and won 115-107. The second game was a grinding Boston rout, as the Heat shot 34.8% from the field and lost 91-72. The Celtics again controlled the pace in the third game, a 115-107 win in which scoring was sparked by offensive efficiency on both side. Both of these teams are hobbled now. The Celtics will be without Avery Bradley, a starter in all three wins and their top defensive guard, after he had shoulder surgery Friday. Ray Allen has a sore ankle; Paul Pierce a sprained knee. The Heat aren't expecting forward Chris Bosh to return from an abdominal strain for the series. Bosh may not be missed. He shot 7-for-24 in the second and third regular-season meetings. Bosh stretches the defense and opens up the pick-and-roll game for Miami, but Boston defends it well. It's Bradley's injury that may be the Celtics' undoing. Allen can't guard Dwyane Wade normally, and he'll be especially taxed with his ankle injury. Wade struggled in the first three games against the Pacers, but he totaled 99 points on 61.5% shooting in the final three. The adjustment: Wade figured out how to score without Bosh, his pick-and-roll partner. Then there's LeBron James. At his best, Pierce is perhaps the league's best answer for the Heat forward. But he's a step slow right now, playing through pain. The Celtics will mix things up against James, using Mickael Pietrus along with a few bigger players to defend him physically. But if Pierce can't keep up with the MVP, no Celtic can. Boston looked old at times. Boston looked lucky at times. Boston looked gritty at times. A short turnaround â" Game 1 is Monday (8:30 p.m. ET, ESPN) â" won't help. Allen will have to hit his shots; he missed the first five threes he took Saturday. 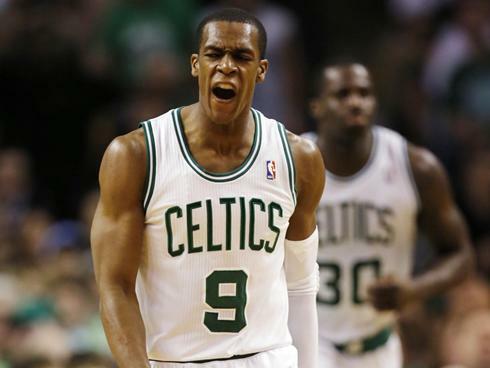 Rajon Rondo will have to dominate the way he did in the fourth quarter of his ninth playoff triple-double performance. Garnett and Pierce will have to play like the future Hall of Famers they are. Even then, the Heat still may win. 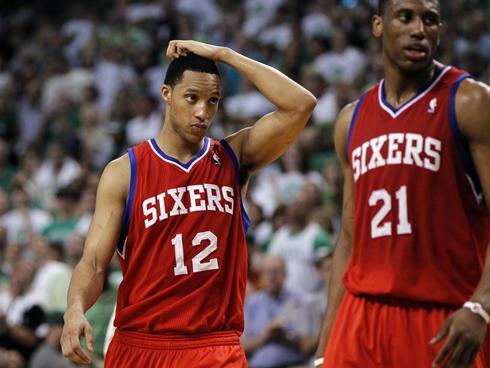 Philadelphia's future hinges on Evan Turner. The second pick in the 2010 draft hasn't looked the part, but the 76ers are in need of identity. Turner was expected to be an offensive conduit, a skilled swingman who played point guard at Ohio State. But his power scoring hasn't translated, and he can't hit jump shots. Turner shot 33.8% from the field in the seven-game series against the Celtics, with 10 of his shots blocked despite his athleticism and size. Coach Doug Collins would love to build his team around Turner and point guard Jrue Holiday, but Andre Iguodala instead has carried the mantle on the wings. 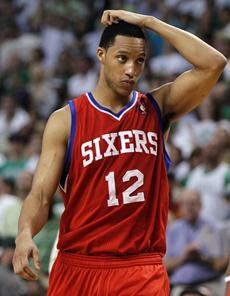 "I can't begin to describe how disappointed I am in Evan Turner. Train wreck after game 3 of CHI series. I don't want silver lining," 76ers blogger Derek Bodner tweeted. Rondo is the Celtics' best player. He's one of the most unique players in the NBA, with the ability to slow down the game and find open teammates. 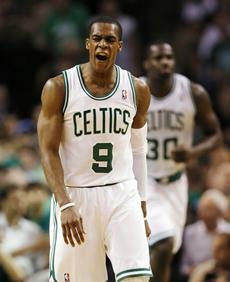 Rondo assisted on Boston's first four field goals, then scored its fifth. He went on a personal 9-2 run late in the fourth quarter to give the Celtics an 80-70 lead, even making a three-pointer in the process. At times, Rondo's statistics pile up invisibly. In the final quarter, he was at full force. He finished with 18 points, 10 rebounds and 10 assists, and those seven turnovers were mostly inconsequential. Pierce has a penchant for the big moment, and Garnett yells a lot at everyone. But Rondo's passed both. The Western Conference finals should be memorable. The San Antonio Spurs have reeled off 18 consecutive wins dating to the regular season. The Oklahoma City Thunder have knocked off teams responsible for the past three NBA titles in nine combined games. Game 1 Sunday (8:30 p.m. ET, TNT) may favor the rested Spurs, who are nearly unbeatable at home. But we'll be tuned in for every minute.